Ukraine is followed by the European Union. 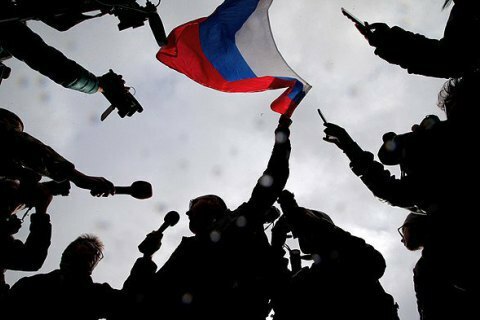 Two-thirds of Russians believe that Russia has enemies and the main ones are the USA, Ukraine and Europe, according to a poll by Levada Centre. The poll held early last month found that 66% of respondents asked whether Russia has enemies responded affirmatively, while 21% did not agree and 13% found it difficult to answer. Those who believe that Russia has enemies said that the nation's main enemies were the United States (68%), Ukraine (29%) and the European Union (14%). They are followed by former Soviet republics (10%), Poland (8%), Germany, NATO and England (6% each), and supporters of Islamic State (5%). Countries of the Middle East and "those who are in power today (officials /government /"Putin's friends") received 4% each. Also, the majority of respondents believe that Western countries and NATO members have reasons to fear Russia. Approximately the same number of respondents believe that the Russian Federation should also be afraid of countries that are members of the Alliance. A worldwide poll by Pew Research has found that 31% of residents of 37 countries consider Russia one of the main threats to their states.